Brand new and has never been read. Limited to 999 signed and numbered copies. Signed by author Joe Hill and artist Charles Paul Wilson III. 26 New Illustrations (13 color, 13 B&W). Features a full color wraparound dust jacket. Detailed map of Christmasland featured in the end pages. Uniquely remarqued by the artist. Bound in debossed book cloth. Housed in a hand-built cloth slipcase. 11.75 x 7.75 x 3 in. Charlie Manx is a very bad man with a very special cara 1938 Rolls-Royce Wraith with the vanity plate NOS4A2. Charlie takes children for rides in his car, all the way to Christmasland. Christmasland is a magic place, a place just for children. Victoria McQueen has a gift for finding lost things. If she rides her bike through the Shorter Way Bridge, she can find anything thats lost. Shes also the only person ever to have escaped from Charlie Manx. Charlie may have died, but he hasnt forgotten Victoria, and he takes her son for a ride in his car. Victoria McQueen will do anything to save her son, but the Shorter Way Bridge has become a more perilous crossing than it was when she was a child. And who wouldnt want to have Christmasforever? In his terrifying new novel, NOS4A2, New York Times bestselling author, Joe Hill, makes sure youll never listen to Christmas carols without a shiver again. But more than just horror, NOS4A2 is a story of strength, of magic, of family, and the costs of love. Its about finding what is lost, even when what we lose is ourselves. The author of the critically acclaimed Heart-Shaped Box and 20th Century Ghosts, Joe Hill is a two-time winner of the Bram Stoker Award, and a past recipient of the Ray Bradbury Fellowship. His stories have appeared in a variety of journals and Years Best collections. He calls New England home. These policies have eliminated 99.9% of damage complaints from DRP customers. If a book is out of stock in the DRP offices we will notify the customer to make other arrangements and/or fulfill the order via one of our fulfillment centers. The first signed, limited edition of Joe Hills New York Times bestselling novel, NOS4A2 published by IDW is now available for preorder from Dark Regions Press. 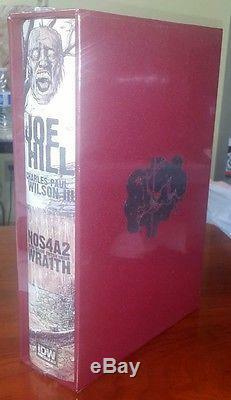 The book is signed by Joe Hill and Charles Paul Wilson III and is hand-numbered to 999. Includes the 172-page graphic novel prequel, Wraith. 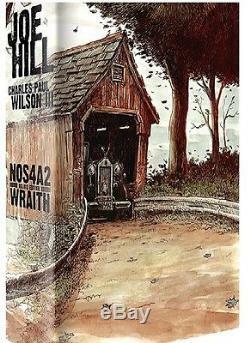 Exclusively for this collection, Wraith series artist Charles Paul Wilson III has created 26 new illustrations (13 color, 13 black and white), a new full-color wraparound dust jacket, and a detailed map of Christmasland featured in the end pages. Wilson will also be personalizing each Christmasland-themed signature plate with a small original sketch inside a gruesomely twisted advent calendar. This 852-page oversized hardcover is packaged in an ornate hand-built cloth slipcase and features a debossed cloth cover. Joe Hills New York Times bestselling novel, NOS4A2, introduced readers to the terrifying funhouse world of Christmasland and the mad man who rules there: Charlie Talent Manx III. Now, in an original new comic miniseries, Hill throws wide the candy cane gates to tell a standalone story that is at once both accessible to new readers and sure to delight fans of the book. 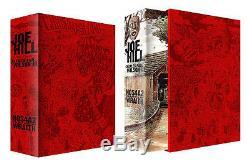 The item "NOS4A2 / WRAITH JOE HILL SIGNED & NUMBERED HARDCOVER DARK REGIONS PRESS" is in sale since Thursday, April 13, 2017. This item is in the category "Books\Fiction & Literature". The seller is "musicfan66" and is located in Jackson, New Jersey.